Be part of a global movement to end the violence in Syria after three years of conflict. 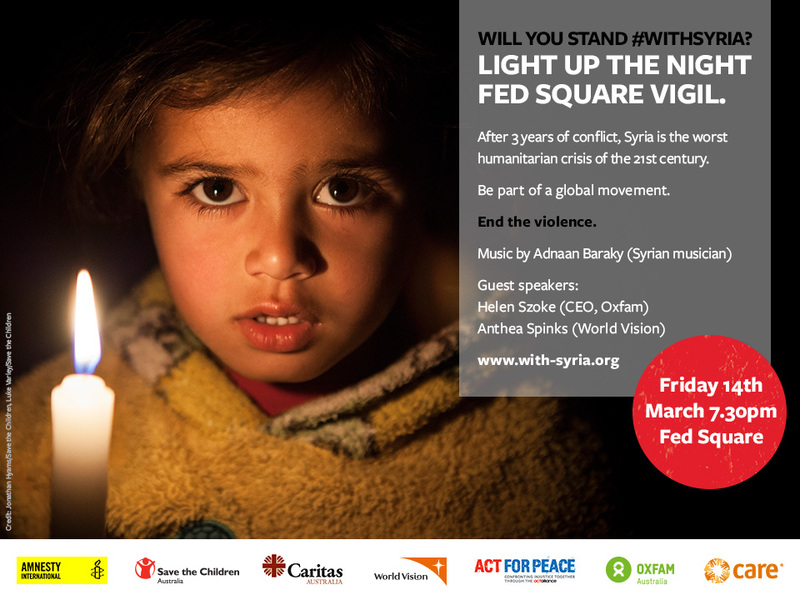 On Friday 14 March at Federation Square, Australians will gather together for a vigil to stand with the people of Syria. The conflict in Syria is the worst humanitarian crisis of the 21st Century. More than 100,000 people have been killed in the conflict, including 11,000 children. 2.5 million people are living as refugees. Now is the time to call on the Australian Government to do all it can to make sure the people of Syria do not lose another year to bloodshed and suffering. It’s not about taking any side in the conflict, but standing with the millions of Syrian children, women and men who are struggling each day to survive this crisis. Vigils will be held from sunset around the world, from Zaatari refugee camp in Jordan to Washington DC. Please help us light up the night and make the global vigil’s message resonate around the world. If you’re unable to make the vigil in Melbourne, visit http://www.with-syria.org/ to find out how to hold your own vigil on Friday 14 March. This entry was posted in Campaign, Events, Human Rights, Melbourne on March 13, 2014 by developmentcircle.